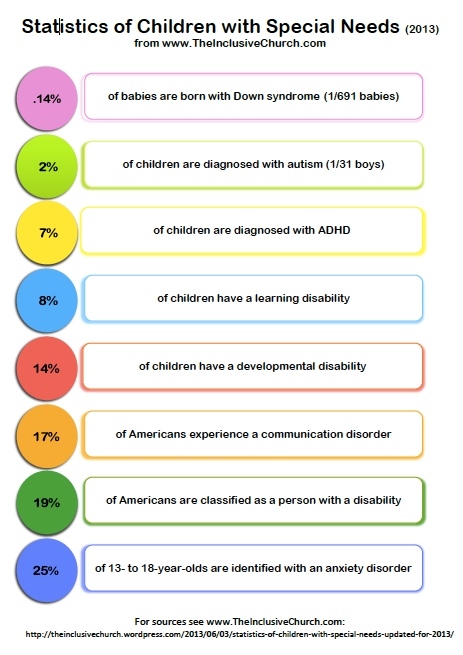 Three years ago I spent several days researching to find as many statistics as I could related to children with special needs. After reading through countless webpages of official government studies and data, I wrote this post to show church leaders that the number of families impacted by disability was growing and more prevalent than our church attendance reflected. That post turned out to be incredibly popular. And thanks to a increasing number of influential voices in special needs and ministry circles, churches are getting the message. Because the older post with statistics remains so popular, I thought I’d offer an updated post today with the same stats I share in Chapter 3 of Leading a Special Needs Ministry: A Practical Guide to Including Children and Loving Families. Feel free to repost or repin the infographic (image) above. It is appreciated if you link it back to this site. Thanks! With these statistics in mind, can any ministry ignore the need to prepare for participants with learning differences and disabilities? Greetings….you left off a large portion of Americans when you didn’t include Mental Illness. Approximately 1 in 4 adults and 1 in 5 children have a diagnosable mental illness in the US. You only listed anxiety. Follow The Inclusive Church on Facebook!